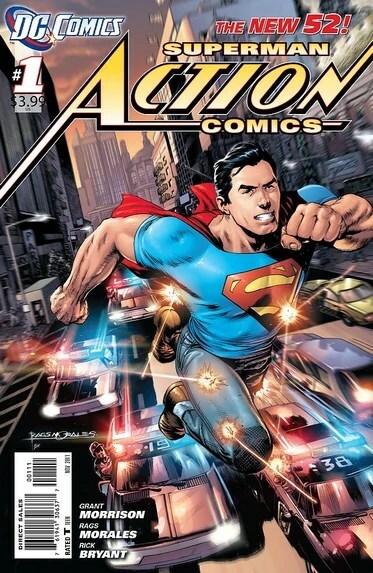 Action Comics has been in existence ever since the modern day superhero comics have been in existence. It started in 1938 and introduced us to the adventures of Superman. There is no comic as popular and with so much history as Action Comics. Its had a 900 issue long run since 1938 till 2011. DC Comics was taking a big risk by starting the issue all over again from scratch. The risk seems to have paid off because you have new readers joining in and we have a fresh new perspective on Superman. I am a big superman fan and I thoroughly enjoyed the 4 issues that have come out till now. In this article I am reviewing the first two issues. In the first issue we have Grant Morrison introducing the caped crusader and along with him a set of other well known characters like Jimmy Olsen, Lois Lane, Lex Luthor, General Lane and Clark Kent. 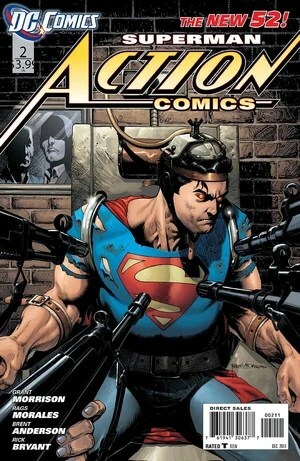 I must point out that Morrison has introduced us to a Superman right from Action Comics No. 1 (1938). He is young, leaps from building to building and sees himself as a vigilante. He is massively different from the superman we know and have grown to love. It seems like a forcefull homage to the 1938 Superman. But this is not entirely a bad thing. With this I see Morrison taking his own sweet time to develop and form the modern day Superman. I have read the 1938 book and I really like the modern take on the same in this first issue. I like how his tights are replaced by a simple Jeans and Tshirt with a shorter cape. The story is fast paced and full of action. The dialogue is strictly ok. I say this because I noticed that while reading, the dialogues put a brake on the otherwise fast moving book. He dodges a bullet, stops a train, beats up bad guys. But this young Superman is a bit different. He feels pain too. The scene where he bangs a tank with a demolition ball, he is seen uttering ‘GD’. Now GD as we know is text-lingo for God. I really don’t know why Superman would mutter that. I frankly am offended that Superman has to say that. But I give in to Mr. Morrison here because he is trying to do something different than what we are used to. The art is crisp and sharp. Perfect for such a book. The faces emote properly and the expressions of Superman are the best when he is in action. The scenes where Clarke is being nice to his land-lady are really nice. Overall, Issue 1 lives upto its potential and does not disappoint. There is something for everyone. New fans can hop on, and old fans can enjoy a rather different take on Superman. Issue 2 begins right after Issue 1 left off and we see Supes bound in chains and on a what looks like an electric chair and who eventually escapes later in the book. Lex is of the firm opinion that Superman is not human and that the laws of the United States of America apply only to human beings. Hence the torture. But Superman endures it. In one rather surprising scene, General Lane is ordering his troops to firs at Superman’s cape (nothing happens to it). Why would you do that? And what was the point of that? Maybe it is a plot point but I found it rather stupid. Issue 2 moves faster than Issue 1. Dialogues are better too, especially Lex Luthor’s. The art stays the same although there are a few awkward moments when Lois Lane is sometimes fat and sometimes thin. But I am nitpicking. It is thoroughly entertaining and the since the story is starting to reveal itself I find myself waiting to read the next issue.